TeamViewer is computer software that has made possible the access of computers remotely and that too for free. With this software users can access the computer sitting at any other place other than in front of their own system or PC. Basic use of TeamViewer software is remote access, computer troubleshooting i.e. detecting the problems of the system sitting at any other place and also resolving them as well, other uses of TeamViewer can be online meetings, online conferencing and transfer of files from one system to other without actually accessing it. Earlier this software was available for desktop and laptops only but nowadays because of its wide use, its latest version i.e. TeamViewer 10 is available for Windows and Mac mobile operating systems as well. TeamViewer has gained a lot of popularity these days and is used as normal software. Few steps to be performed and users can login into the other computer by sitting somewhere else. For instance if user’s system has got some software issue then it can be resolved simply by sharing the user’s id and password with the Technical person, that person instead of arriving at premises himself would rather access the computer sitting at his office by the login credentials provided by the system owner. Moreover, the system owner can also keep a check over what other person is performing on his or her system as screen of system would actually show what work is being done on the system. If user feels that the work is not right then the connection can be stopped in mid of the session itself. TeamViewer provides the facility to record session. However recording of sessions is not needed all of the time but still these provide a basic security type of feature. As in user can keep track of their meeting session or any other important login session track for their own future use or reference. 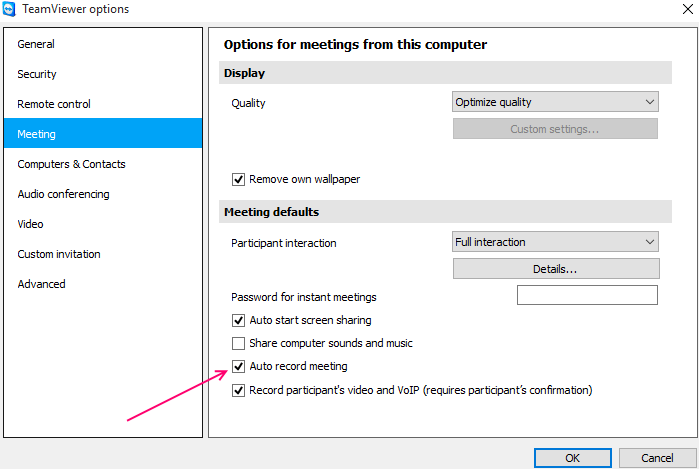 General format of the session recording is “.tvs” format which can be changed to the most used and an easy to access format that is “avi” format from the default settings itself. You can reboot the client machine with teamviewer remotely. The real advantage is that connection with your connected PC does not gets lost. If the windows PC asks for login credentials, the user sitting at the remote PC can fill in his authentication details to continue the process. Here comes another wonderful feature of TeamViewer which every user would love. Its remote printing. Here in user can print the files from one system to a printer that is located far away. For instance, user created a documentation and for some reason he or she could not make up to the office on time. And that very documentation cannot be mailed so user can simply use the office printer for printout of the documents while staying at home itself. File transfer is another feature. Likewise it is about remote printing, user can also transfer the file from one system to another using TeamViewer. Now here is a glitch, user needs to be very careful that with whom they share their id and passwords because anybody who has the login details can use the TeamViewer to steal their personal data stored in system, and misuse. Earlier versions of TeamViewer needed both the connected systems to be switched on as its basic requirement but the latest version i.e. TeamViewer 10 has a feature called “wake up Lan” wherein the basic requirement of the other system being turned on by anybody else has been eliminated. Users can use TeamViewer to turn on the pc whenever they want with the help of TeamViewer itself. As the name itself suggests two factors authentication is a security step that is taken care of. Likewise we have in Gmail login a two step verification same is here. A security code is generated at time of login which is to be provided even after the username and password. A TeamViewer account does not essentially needs a TeamViewer account. TeamViewer has a built in VPN tool which creates a secure anonymous VPN tunnel betwween the two. For this you have to first connect to the client then click extra and then VPN option. This also lets you securely trasnfer file through VPN connection.